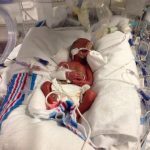 In our March edition of our Preemie Family newsletter we learned about 25-week preemie Isaac Nathaniel Lalunio. He was born at 1 lb. 4 oz. and spent 10 months and 22 days in the NICU before being discharged to home. 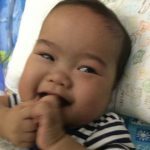 Read more in an update by his mother, Consuelo, below. Isaac finally came home on February 25, 2014 after being in the NICU for 10 months and 22 days. It was something we were excited about but nervous at the same time. How do you take care of someone who has been taken cared of by health professionals since he was born? Will he like being home? Will he be okay? Will I be able to regain my slowly disappearing sanity? 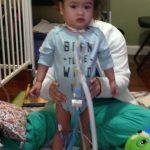 He has been out of the NICU for almost a year now. He has been sick twice that required antibiotics but no hospitalizations except for a tricky trache change and that was just for observation. 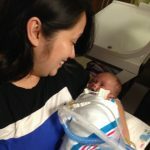 When I look back on those first few days and weeks in the NICU it seems like it was a bad dream. Every time I sat in front of the isolette where Isaac was, the doctor who has him for that week would sit by me and update me as to his condition which is usually depressing. I just nodded my head and kept staring at my baby through the glass. I had found a chant that I would say over and over again as I pray over him, “That which is impossible with man is possible with God”, Luke 18:27. That verse carried my husband and I through tough times during Isaac’s NICU stay. When we came home it was another set of challenges. Nursing staff, DME company, therapy, supplies, etc. We took everything a day at a time and because I had to be the one to deal with the day-to-day situations I learned to be a true advocate for my son. If I was already an involved parent when Isaac was in the NICU, I became even more obsessed when we came home. Sometimes, the nurses probably thought I was OCD. But my goal was for my son not to go back to the hospital so I did whatever it took to keep him home. I explained to my nurses why I was acting the way I was. I showed them pictures of Isaac when he was born and told them of the challenges he had faced and overcome. I made them realize that I needed their help. It was also the same with therapy. He has physical, occupational and speech therapy. They all had to do an assessment before admitting Isaac in their caseload. The findings were pretty gloomy. I told them that Isaac is someone who knows his own mind and that as long as he is making progress I did not care if he wasn’t doing what every one year old was doing. He has been making strides in every aspect of his being since the time he came out of the hospital. What else can a parent ask for? There are days when I feel extra tired and I ask myself how much more of this I can take. But as soon as that thought pops in my head, I am reminded of the first few weeks of his life when we weren’t even sure if he would make it through the night. How could I have lived through that nightmare? With God’s grace and the strength He gave me to carry on each day and with the help of family and the valuable nurses and therapists that I consider as stakeholders in Isaac’s growth and development. At present, Isaac is a normal one year old who is soon to be 2 in a few months. He gets in trouble most of the time but is nevertheless the most sweetest and happiest child I have ever seen! Sign up for our FREE subscriber-only Preemie Family print newsletter here. Sign up for our FREE subscriber-only Preemie Professional print newsletter here.